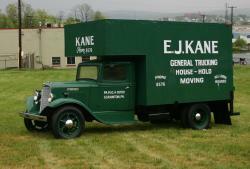 When you enter KANE's Northeast distribution campus in Scranton, PA you'll spot a vintage delivery truck from the 1930s. It's our original truck and there's something about it that, despite its skinny tires and pint-sized engine, make it far more powerful and important than the big rigs that surround it. That something, I think, is a sense of history and culture that's getting lost in today's logistics outsourcing environment. 3PL mergers and acquisitions have become commonplace. They help expand an organization's service and geographic scope and achieve operational synergies that can be passed on to customers. So bigger is often better. But what can be lost, as 3PLs expand through acquisition, is a strong and uniform culture. Organizations that outsource a logistics operation want to know their partner has processes and systems to do the job, but also has people who share their same sense of urgency. People who sweat the details in the same way they would. That comes down to attitude, and it's hard to teach attitude in an SOP manual. Attitude comes from culture. For us, keeping the original KANE truck visible is a daily reminder that, no matter how much we expand into new markets, our culture is really what binds us – to each other and to our customers. Read our associate handbook, which shares the philosophy of our founders on how logistics service providers must act.